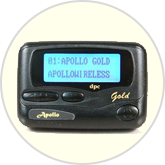 The Apollo 929 Gold (AL-A25) alphanumeric pager is a standard sized 4-line display pager. It includes a left/right button for easy access to menu choices and settings. The Apollo 929 Gold LCD screen is actually about 10% larger than screens found on other standard sized pager models. It performs all of the same functions as the comparable Motorola and Unication products, but at a much lower price point. The Apollo 929 Gold (AL-A25) boasts a solid, durable housing and includes a holster with a clear protective lens shield that allows viewing the screen without removing the pager from the holster. It is the only standard sized 4-line alpha pager that is available in a choice of colors.